Unit Text: 3rd Reserve Bn. 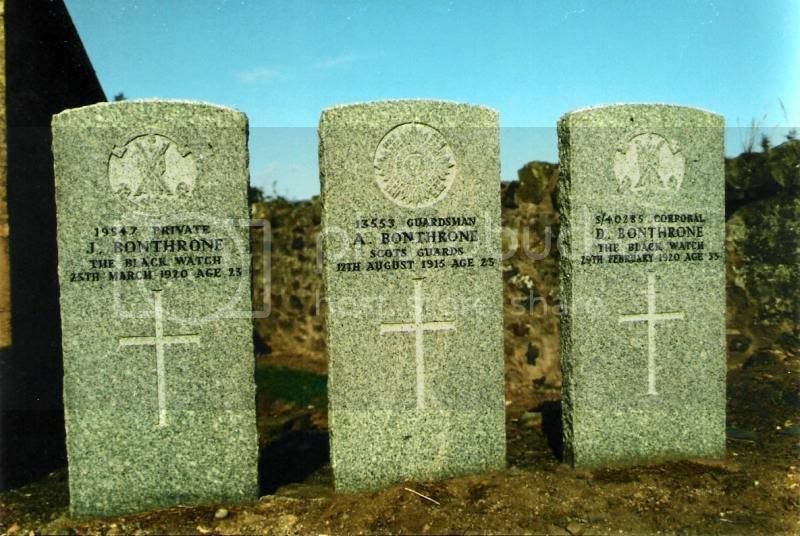 Additional information: Son of William Bonthrone, of Green of Invermay, Forgandenny. At Westminstar, London, an inquest was held into the death of Alex. Bonthrone, aged 23, a private in the Scots Guards, who was killed by lightning at Kensington Gardens. Private Bonthrone was a son of Mr and Mrs Wm. Bonthrone, Invermay Gardens, Forteviot. Up until about six months ago, before enlisting, the deceased was employed as a gardener at Dupplin. The evidence showed that the deceased and two other Scots Guardsmen were walking through Kensington Gardens when they were overtaken by a shower, and sat down on chairs under a tree. Private Watts said all three were thrown to the ground, and he must have been rendered unconscious. Bonthrone was lying across his legs. Private Eric Hutchison said the crash was like a bomb dropping. He was knocked down unconscious. Sergeant Rogers, Royal Fusiliers, explained that the three men and the chairs were knocked down, and he found that Bonthrone was dead, Watts was unconscious, and Hutchison was yelling out in great pain. He saw very little lightning. The jury found that Private Bonthrone died as the result of being struck by lightning. Additional information: Son of William and Helen Bonthrone, of Green of Invermay, Forgandenny, Perthshire; husband of Betsy Bonthrone, of Ruthvenpark, Newhouse, Perth. Grave/Memorial Reference: B. 35. 16. Almost unique I would have thought to have 3 brothers all buried at home? John Bonthrone was a Grocers Assistant and died from Tubercular Disease of the Spine aged 21. David Bonthrone was a Ploughman and died from Suppurative Axillary Adenitis. Secondary Haemorrhage. Aged 33.